A new study has highlighted beavers "exceptional" ability to rebuild diverse wetlands. Scientists from Stirling University looked at the effects a group of beavers had on a wetland in Tayside originally drained for farming. The 12-year study found plant richness rose by 46% and the number of different plants recorded more than doubled. The study is the first to measure the environmental benefits of the beavers' activity over time. Between 2003 and 2015, the beavers constructed 195 metres of dams, 500 metres of canals and an acre of ponds at the site on a private estate in Blairgowrie, Perthshire. Scientists said the surrounding vegetation "increased in complexity" by 71%. Prof Nigel Willby from the university said wetlands were "tremendously important environments" for biodiversity, but were disappearing at an "alarming rate". He said: "Beavers are renowned for their engineering skills, like dam building, and are now being considered as tools for restoring wetlands. "They have been reintroduced widely, including in Scotland, partly for this purpose and our findings demonstrate the surprisingly large benefits they can bring to biodiversity." The study was partly-funded by Scottish Natural Heritage (SNH) and published in the international journal Science of the Total Environment. 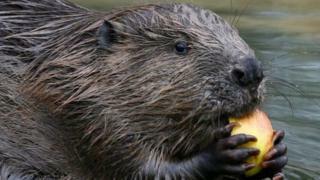 Following trial reintroductions, Eurasian beavers were readmitted to Scotland last year, 400 years after being hunted to extinction in the UK. Co-author Dr Alan Law said: "We know lots about the benefits of beavers in natural settings, but until now we did not know the full extent of what they can achieve in present-day landscapes where restoration is most needed. "Seeing what beavers can do for our wetlands and countryside highlights the diverse landscape we have been missing for the last 400 years."